Four years ago in mid-October, less than 3 weeks before the mid-term elections of 2010, it wasn’t looking good for the Democrats. Indeed, that was the election in which the Republicans wrestled a House majority away from Nancy Pelosi and her fellow Demonrats. 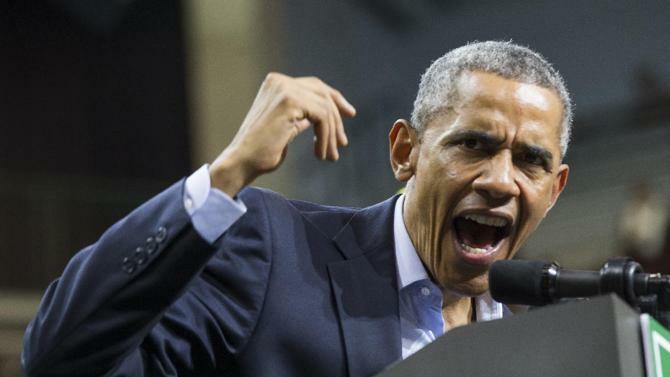 In campaign rallies during the weekend of Oct. 15-16, 2010, Obama was angry. These were some of the pics taken of Obama in those 2010 rallies. Trust what your instincts tell you. Flash forward four years to another mid-term election campaign rally. As in the midterm elections of 2010, once again it’s not looking good for the Demonrats. The pic below was taken of Obama when he spoke at a rally for Gov. Pat Quinn, D-Ill., at Chicago State University on Sunday, Oct. 19, 2014, in Chicago. Look at his eyes!!! Trust what your instincts tell you. Here’s a close-up of those eyes. I see anger, desperation, madness…. And behind those eyes, there’s nobody there. As in 2010, once again Obama’s mask — the narcissistic psychopath’s “charming social mask“ — is slipping and what emerges sure ain’t pretty. This entry was posted in 2014 Election, Congress, Evil, Liberals/Democrats/Left, Obama, occult, Republican Party and tagged demonic Obama, Drudge Report, Obama at October 2010 rallies, Obama at October 2014 rallies, Obama lord of the flies, Obama's frightening eyes, rally for Anthony G. Brown, rally for Pat Quinn, Rush Limbaugh. Bookmark the permalink. I am *so* glad that I’m not the only one who sees that!! I don’t think that I’ve ever seen eyes like this man has. Sometimes they seethe with unmasked hatred and rage, sometimes they smirk with scarcely concealed condescension and amused aloofness, yet *always* they are cold and empty. It’s more than a little disconcerting. Agree! And I’ve seem some pretty weird pics of “HELLary” as well. He looks like Beyonce at the Super Bowl after she allowed herself to become possessed. he disrespects israel he disrespects the unborn, he pushes the gay agenda he disrespects our military,he disrespects the christians and the jews,he wont seal our borders,he wont stop the flights from west africa,on and on! he is in love with himself! This guy has given me the creeps since the day I first laid eyes on him, he has a satanic feel to him. I would not be surprised to see him levitate, spew green vomit and spin his head like the Tilt A Whirl. The flies that seem to be part of his entourage are disconcerting also. Creep factor pegged out at 10!!! Thank you Dr. Eowyn for this fascinating post and for providing the pictures in 2010 and 2014 for comparison purposes. I also see in his eyes, anger, evil and a terrible rage that will stop at nothing. God help us! The ancient men who are behind him are getting impatient for him to advance their agenda before they die and if he doesn’t… They do go after their own and he knows this.